Did you know there are at least four different names for the clam? Depending on where you live, it could be called a gaper, soft, sand or steamer along with other countless local variations. It is another shellfish that doesn't seem to be widely used even though it is common along most sandy/muddy shorelines. The bigger, very fast growing specimens reach 150mm long and can live for up to 28 years. Smaller specimens are generally found in the upper regions of the shoreline and the bigger ones lower down towards the extremes of big low tides. They can burrow up to around 50cm deep and are easy to dig. Most anglers who dig their own bait come across them by accident, but they are easy to identify having a cream/grey/black colour and ovoid shape with the feeding siphon protruding at one end. Like razorfish, they feed through a siphon tube that can extend up to 40cm in the bigger specimens. They can be found in large colonies in some estuaries and, like razorfish, can often be found by their tell-tale key-shaped or round hole found on the surface. To dig them you first need to find any tell-tale hole or depression in the ground. A spit or trenching shovel will be a lot more effective than a fork for this type of work. Start by digging a hole around 40cm deep alongside the surface hole and then cut away the ground where the hole is to follow the exposed burrow down to the clam. With a bit of practice you should be able to uncover the clam very quickly with little effort as they rarely burrow very deep. Clams are excellent bait for winter cod, both from the shore and boat. They used to be one of my favourite winter baits, only recently surpassed by the increasing availability of razorfish in my area. I still use them a lot and tend to use shellfish baits a lot more than other local anglers. When I was younger my biggest cod of nearly 8lb was caught on a single big clam and it was many years before I beat that fish, so the humble clam is a top cod bait for me. The problem is that several other baits can also outfish everything else. So the trick is to choose the right time to use a particular bait type rather than taking a lot of different baits with you, which can be expensive. Like most shellfish, the clam tends to fish best after a good heavy sea or in heavy surf when fish will be hunting the surf line for washed out, smashed up natural food. Here on the North East coast clams are seen as a hard weather bait, only used in severe conditions when most fish don't seem to be feeding on the more obvious worm or crab baits. I use clams as part of a cocktail bait together with lug and rag, but occasionally use them on their own. A clam is easy to open with the edge of a knife or pair of scissors. The body is usually quite big and full, so together with the siphon will make a single big juicy bait or several smaller ones. The clam is scooped out of the shell in one go with a simple cutting movement of a knife or can be broken open by tapping the shell on a hard surface. Cut away the siphon part from the main body and remove the brown membrane, then cut the siphon lengthways down the middle into two halves. 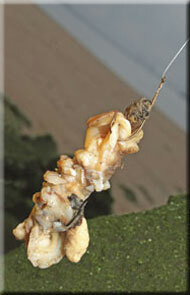 Tip off a worm bait with each half to make a bigger bait. When using smaller baits the siphon can be cut in half, then each half cut down its centre to get a total of four baits. The softer body can be cut up to make smaller baits and is effective for flatfish, particularly flounders. You will have to bind this soft bait on the hook with elastic cotton. 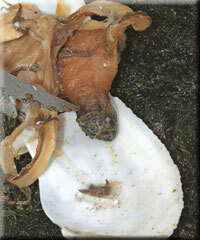 The tough lip or skirt of the clam that runs along the inside of the shell can be used to tip off another bait. 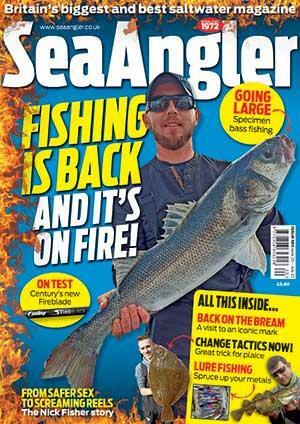 Just hooking a strip of this through the top can make a bait look very attractive, especially for smaller species. Keep clams alive in a bucket of aerated water for several days, but you can freeze them for later use. They are easy to freeze and I leave them in their shell. Give them a quick rinse in fresh water, dry them out on some paper, then lightly wrap them in cling film and freeze in the usual way by placing them on a metal tray in the freezer. If you want to make them last then take them out of their shell first and freeze them cut in suitable sizes. They go from freezer to beach in a wide-mouthed flask, any unused ones going back in the freezer. I have found it deadly for cod, bass, flatties and whiting.